I am lucky enough to play host to the 60th edition of the Accretionary Wedge. First, I’d just like to highlight the fact that there have been 60 previous and excellent wedges and ! WOW. This has to be one of the best blog carnivals out there, and here is to another 60 great AW’s in the future. There are lots of sayings out there about how science is a journey with many steps and paths or a giant building made of many small blocks that contribute to the enormity of an entire field. All of these cliches are pretty much pointing out the same thing. Namely, that the knowledge base in each field is composed of the work of thousands of people all contributing a little bit and slowly building an understanding of the natural world. This is very true, however, some of these contributions are bigger than others, and geology is no exception. Over the history of geology there have been many major discoveries that advanced the science, from the original work of Hutton, Lyell, Steno and Darwin, to more modern revelations. Each discovery has in some way altered our perception of how the Earth works and either opened new avenues of research or provided previously unknown constraints and laws. Therefore, for this wedge the topic will be momentous discoveries in geology or its sub-disciplines that you feel have altered or shaped our understanding of how the Earth works, or opened new doors into research that had never been considered before. The discovery you choose does not have to be universally recognized as momentous but should be in your opinion. It could be something that we take for granted every day, but is in actuality part of the underpinnings of our science. A tool that changed the world. 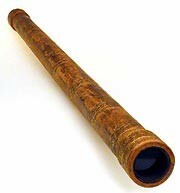 The telescope of Galileo. I just saw it in Florence along with his middle finger! The due date for this wedge will be on September 30 and, as usual, add a link to your post in the comments below. I’ll then compile them into a summary post. Momentous discoveries in Geology? I can think of a few, but this very week is the 50th anniversary of the Vine and Matthews paper that lies at the heart of the discovery of plate tectonics. For my ‘Momentous Discovery in Geology’ i’ve gone for ‘The World of Nano’: historical uses of Nanoparticles and the first time the were described, seen and manipulated. I went for John Aitken and his findings on “condensation nuclei” or as they were later called, “Aitken nuclei”. Awesome! Nice to see Accretionary Wedge reach #60! For my entry I’ve taken a look at GBinSAR technology and how it helps save lives – to me it’s one of the most important developments in geoscience. Hi Matt, thanks for hosting the festival! For my ‘Momentous Moment in Geology’ I have looked at the discovery of the inner core by Danish seismologist Inge Lehmann.